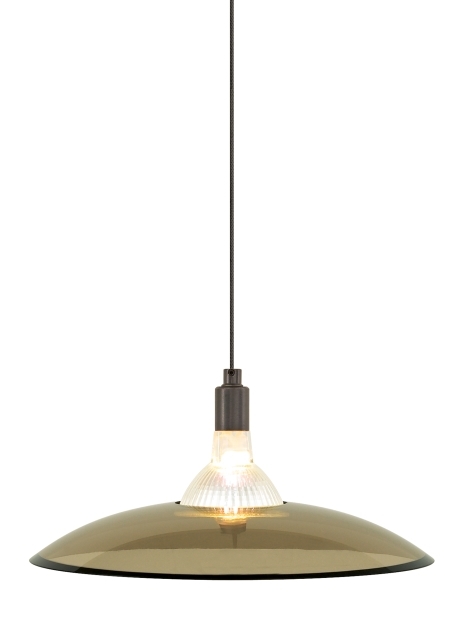 The Diz pendant light from Tech Lighting is best described as simply modern due to its slightly concave yet perfectly circular design. The transparent glass disk floats around a securely exposed lamp. The Diz can be mounted either up or down making it ideal for a host of consumer lighting applications such as kitchen island task lighting, bedroom lighting flanking two end tables and home office lighting. With three transparent color options and three on-trend hardware finishes the Diz is highly customizable to fit your unique space. Pair the Diz pendant with the Monorail system by Tech Lighting for greater design customization in your special space. May be mounted up or down. Rated for(1) low-voltage, 50 watt max/ Dimmable with low-voltage electronic or magnetic dimmer (based on the transformer) (Lamp Not Included). Ships with six feet of field-cuttable suspension cable.